White Pointer boats are invading! When we heard of a custom-built White Pointer 800 Sports Cruiser being delivered to its new owner, we had to investigate. Tasmania is an ideal boating haven and I was looking forward to visiting Launceston to test a new White Pointer 800 Sports Cruiser on its delivery to a new Australian owner. The first hint of things to come was a very bumpy landing in a strong cross wind at Launceston. The forecast from the radio in the hire car suggested winds to 40kts along the coast, not ideal conditions for a trailerboat, even an 8m one. I was starting to hope that proposals to head north into Bass Straight for our test might include a Plan B.
Dave the owner was already at the ramp with the boat rigged on the trailer and ready to go when I arrived at Georgetown near the mouth of the Tamar River. One look at the boat on the trailer and I was hoping I could convince Dave I was his new best friend. It looks dramatic on the trailer with its menacing black finish highlighted by silver linings of hope. 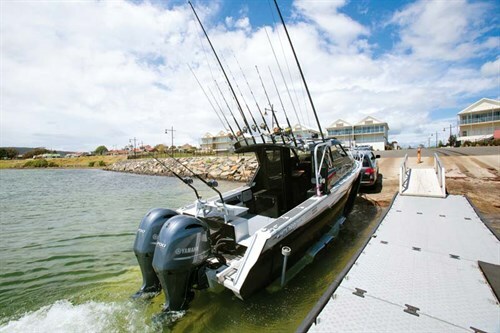 A variety of fishing rods filled the holders while game poles and aerials towered over the show in a commanding display of intent enforced by a pair of 200hp Yamaha outboard engines. 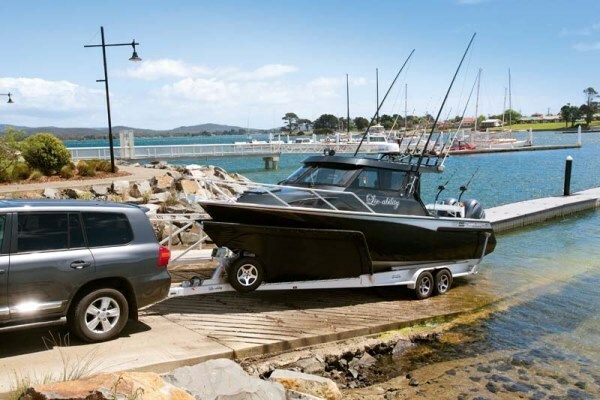 There is no hiding the bulk of the boat on its well-engineered aluminium trailer. Deep sides and the sizable cabin dominate but the elegant sharp entry is hidden by a black mesh stoneguard. 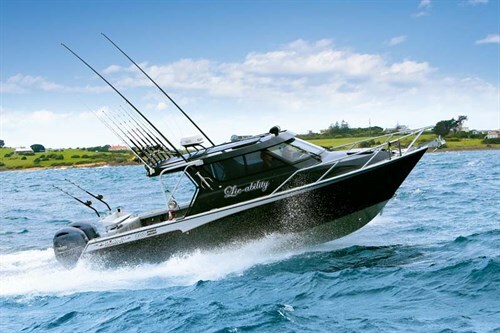 Once it’s floating, the shapely bow gives it a sportier look. 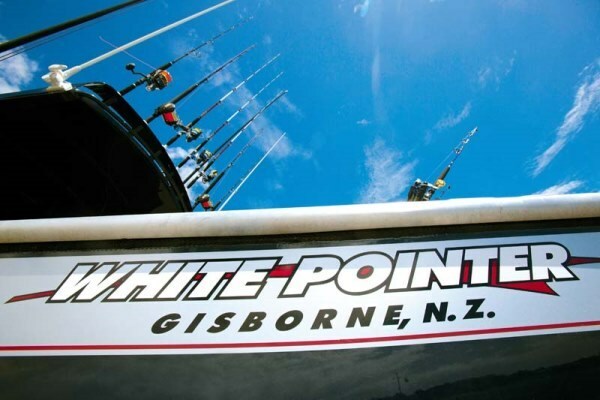 In the time it has been in operation White Pointer reckons it has built some 400 boats, so it is more of a custom aluminium boat manufacturer with a quality not quantity philosophy. All the boats use plate alloy construction and are built around a steel jig for the internal bracing of the hull to ensure fair lines, conforming to the plan. The 6mm skin is shaped over an egg crate and girder frame for strength and rigidity and MIG welded in a sequence they say allows complex curves in the bottom that give the boat its soft ride. All boat builders say that, but it’s one of the main things we came to experience for ourselves. 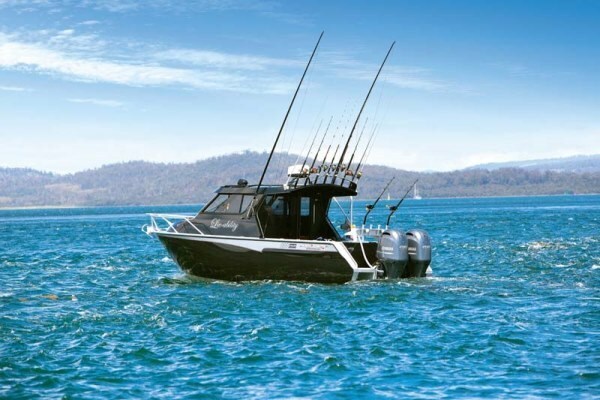 Dave will be basing his boat at his holiday house on Flinders Island, between Tasmania and Victoria, and it’s set up for both fishing and cruising. It’s certainly big enough for both and there’s plenty of room to pack it full of all the options you could envisage. 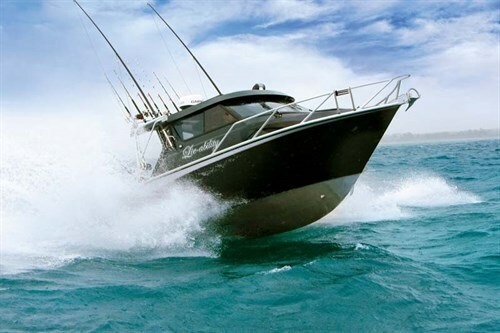 Even devoting the front half of the boat to the cabin, there is still around four metres of open deck space devoted to fishing. 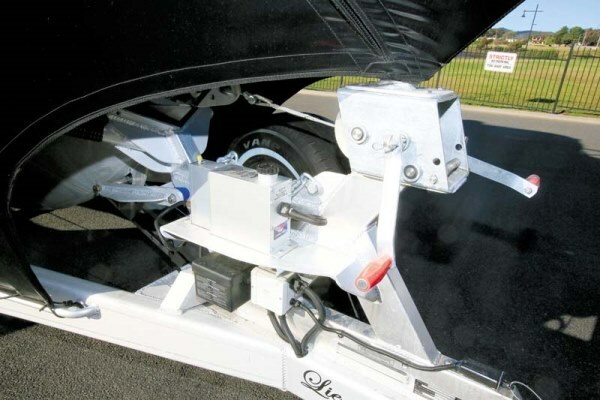 Wide sides are covered in thick non-skid material with three rodholders each side. Underneath is a full-length shelf, well above the floor, to leave room below for gaffs and boathooks as well as footholds for fighting fish. 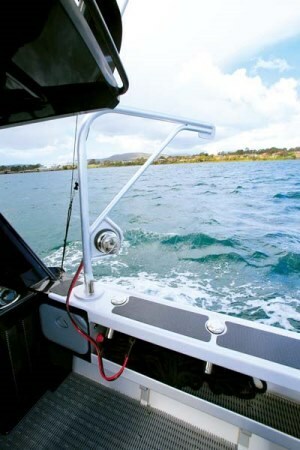 At the transom, a starboard side walkway incorporates a built-in, plumbed bait tank and slide-in door leading out to a folding three-step dive ladder which is also useful for climbing aboard when the boat’s on its trailer. Across the centre section is a removable bait table that must be a metre long! It’s fitted with a nylon cutting board, cup and rodholders as well as a handy knife bucket. Under the self-draining floor are twin 200lt fuel and 150lt water tanks, leaving space for large central kill tanks. 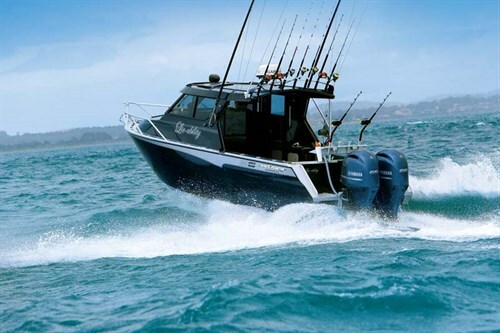 Details like rounded coamings and neatly finished welds add to the quality look of the boat. Because the hull is welded from both sides the exterior weld can be ground down and made neat without sacrificing strength. The front of the cockpit takes things to another level. Below the opening cabin window to port is a chest freezer with a neatly upholstered twin seat on the hinging lid. And on the other side of the cabin doorway is a corner sink with hot and cold water set into a cabinet with a built in storage locker. Built onto the gunwale is a lifting davit with electric capstan winch for bringing lobster pots on board. A strong looking bi-fold door leads into the wheelhouse and it’s here that the White Pointer departs from the trailerboat script. The roof towers overhead to create a great feeling of space and even though the windows are set high they wrap around for panoramic views and lots of light. Large overhead hatches and sliding openings permit a flow of fresh air. 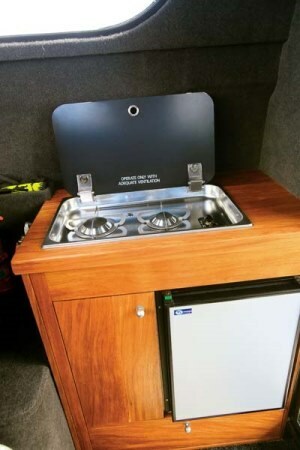 Just inside the door to starboard is a solid pine cabinet with a twin burners built into the top and a 42lt Vitrifrigo fridge and cupboards below. On the other side is a dining setting with timber table with a twin bench seat for two at the back and a single at the front that flips over to make a forward-facing navigator’s seat. 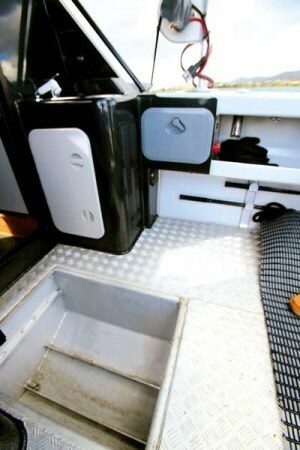 The table can be lowered to create a berth and under the seats are drawers and storage bins. Fittingly, the skipper gets the best seat in the house and it’s a beautifully upholstered black leather number with the boat’s name and company logo embroidered into the back. 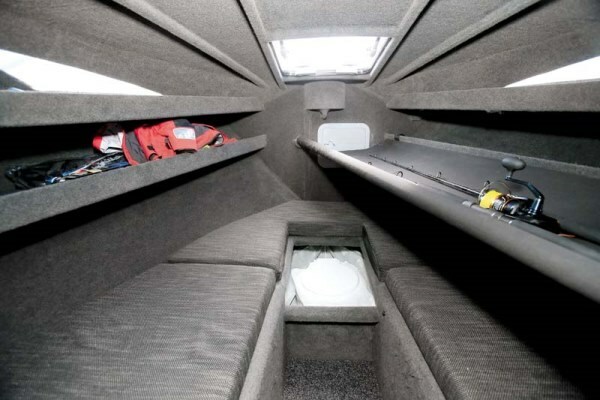 Twin shelves run around the cuddy cabin where long V-berths provide seating or an infill makes a monster bed. Head height is good and, with light from triangular side windows and a clear hatch, its bright and airy. 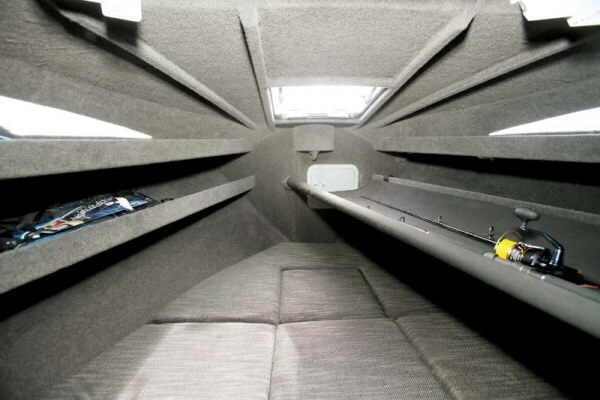 Because of its generous size there is room for a hammock-style bunk with solid rails that is great for safely storing fishing rods, but looks inviting enough for a lie down. 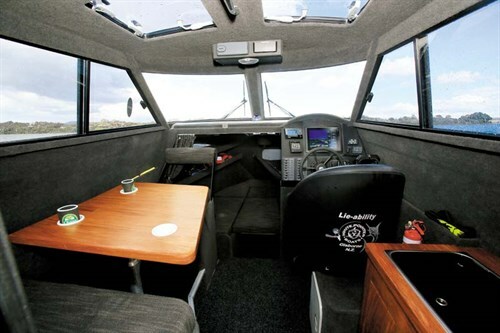 The big sloping dash houses a Garmin 8012 12in touchscreen for Garmin 18mile HD radar, GPS and sounder – a Garmin GSD26 Sounder Network with CHIRP though an Airmar 1kw transducer. A Yamaha gauge gives full engine readout while the Garmin Autopilot would steer the long distances to Flinders Island easier. 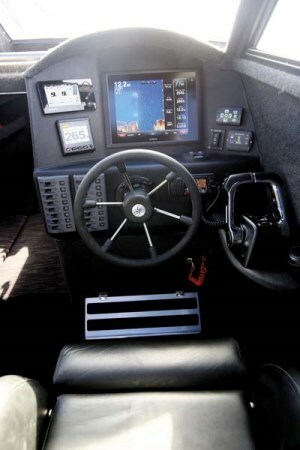 Switches in the top section of the dash control Lectrotabs and the Lewmar 1000 freefall winch. There’s also a gas detector with auto cut-off. 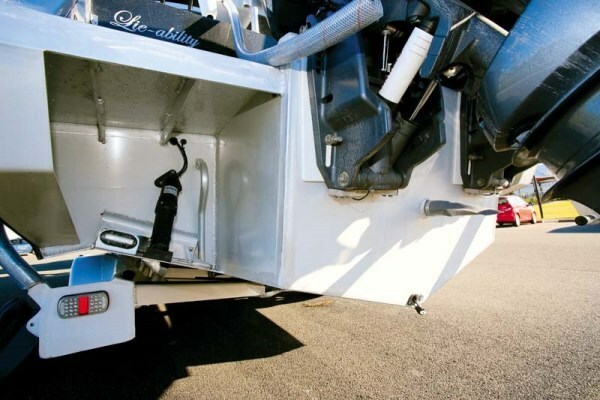 A lower panel of switches operates the wiper/washer, accessories and lights – including a blue transom light for attracting squid and looking smart at the dock. With the VHF reporting that the breeze had settled back to 30kts at Low Head it was time to see what the big boat could do. There’s a good stretch of flat water on the way out and I settled in at the helm and let the Yamaha engines do their thing. The electronic engine controls are binnacle-mounted to the right and felt well placed and smooth. There’s an immediate kick as the props grip the water and propel us forward. We were out of the hole at just over 2500rpm at 13kts and on our way to a top end of 40kts (142lt/h both sides), which seemed to be wind-affected. So I turned around and with the wind on our rear quarter and with an incoming tide we hit 42.5kts. Let’s call it a 41kt two-way average – all this on a 700mm wind chop and with the boat feeling rock steady the whole time. A more sensible cruising speed would be 23kts at 3500rpm (44lt/h) or 32kts at 4500rpm (71lt/h). Handling was smooth and unsurprising with no wallowing and with good vision on all quarters and all lean angles. 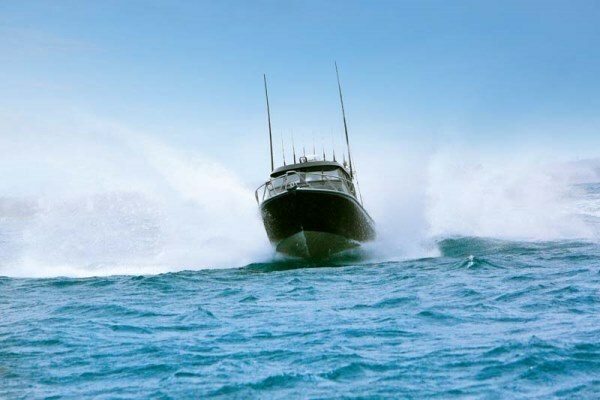 The twin engines showed no sign of cavitation in the choppy conditions and gave the big boat a solid feeling of being stuck to the water in turns. We ventured down the channel and out past Low Head into the rougher water which was a pretty nasty, very close 2m sea, kicked up by the wind and tide. I’m not going to tell you we ran across it at full noise because we didn’t. I would have loved to find some slow swell to play in but what we had was a good test for the boat’s ride as even motoring through at planing speed had the hull high out of the water at times. The ride was as good as could be expected with no harsh banging and, more importantly, it felt very safe and we stayed completely dry inside. With a price of $230,000, that isn’t the sort of budget many have for a boat, which is a shame because the White Pointer is very desirable. For Dave, it should suit his purpose remarkably well as it can fish and cruise equally well and there is room for mates or family to overnight. * Sea-trial data supplied by author. Fuel burn figures are per engine.